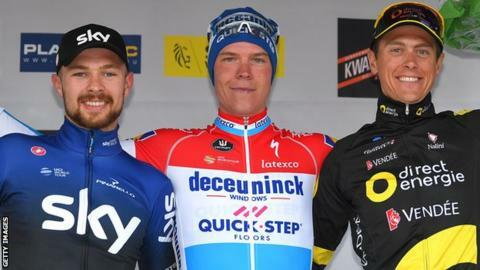 Owain Doull says his second-place finish at the Kuurne-Brussels-Kuurne road race will be "massive" for his career with Team Sky. The Welshman impressed in Belgium to finish second behind breakaway winner Bob Jungels in Sunday's one-day race. It was a second notable achievement of the year for Doull, who claimed his first professional road win during last month's Herald Sun Tour in Australia. "It's massive. It's changed my expectations," he told BBC Sport Wales. "Going there, I was expecting to make steady improvements year on year until I got to this kind of stage. "And now instead of thinking I'd like to play a strong role, I know I'm capable of that. "The expectations from the team will be different going into these bigger Classics like Roubaix and Flanders. "And it's nice to know I'll have the level to support the bigger guys and hopefully play a big role for them as well." Doull, who won a team pursuit gold medal at the 2016 Rio Olympics, joined Team Sky in 2017 from Team Wiggins. Sunday's result was a career highlight on the road for the 25-year-old, who watched races such as Kuurne-Brussels-Kuurne as a child growing up in Cardiff. Next for Doull will be this month's Stade Bianche, another one-day race in Tuscany, where Tour de France champion and fellow Welshman Geraint Thomas is expected to take part. This is Team Sky's final season with their current title sponsors, who have overseen a period of great success - including eight Grand Tour victories - since the team's launch in January 2010. Sky's decision to withdraw its backing means an uncertain future for the team's cyclists, but Doull insists he and his colleagues are not distracted by the issue. "I haven't really thought about it," he said. "Senior management are actively going out there and trying to secure sponsorship for the coming years, and I'm confident they can do that. "I haven't really worried about that too much. The best thing you can do is keep your head down, keep working hard and let your legs do the talking. "By doing that, you're putting yourself in the shop window and you're also putting the team in the shop window, and showing to potential sponsors it's something worth investing in."